I can already hear your groans. 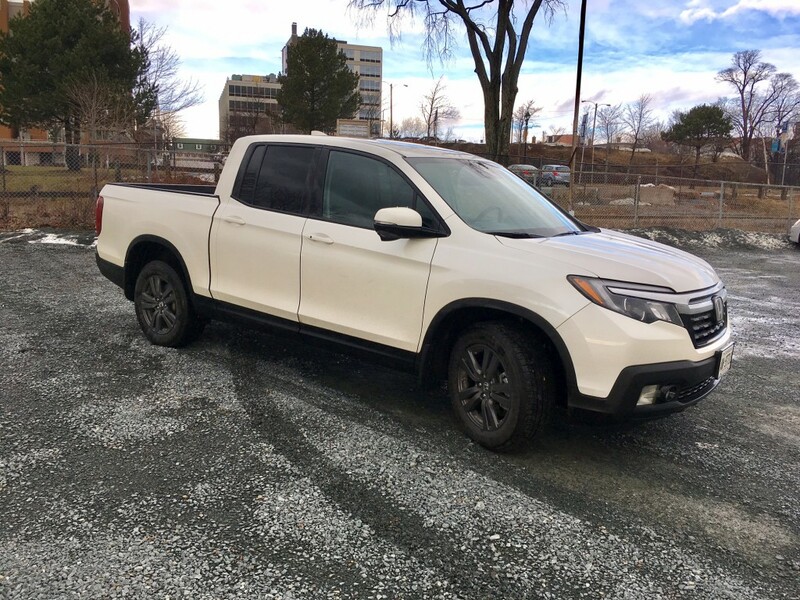 I can already hear the jokes that you thought of a long time ago that you’re just itching to break out in any comment section about the Honda Ridgeline. I get it. To you, it’s not a real truck. And in many respects, you are correct. So let’s all just accept that and move on to the rest of the review because whether you like it or not, Honda put a lot of effort into bringing a second generation of its mid-sized ‘vehicle-with-a-bed’. And they were nice enough to lend me one for a week to hear my thoughts. 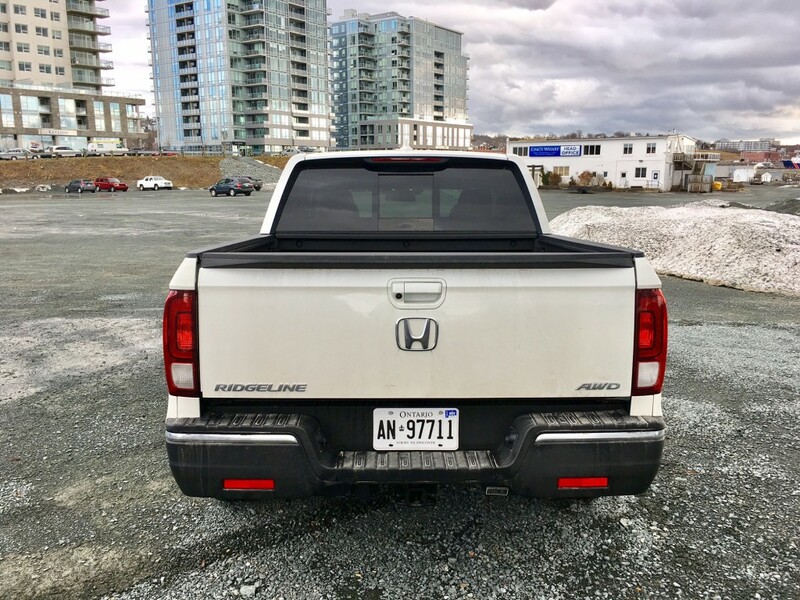 So hear me out, because despite not being a ‘real truck’ the Honda Ridgeline makes a lot of good sense and many respects. Let me tell you what I mean. Okay let’s get this part out of the way because it’s the hardest to defend. The new look isn’t very truck-y, I know. 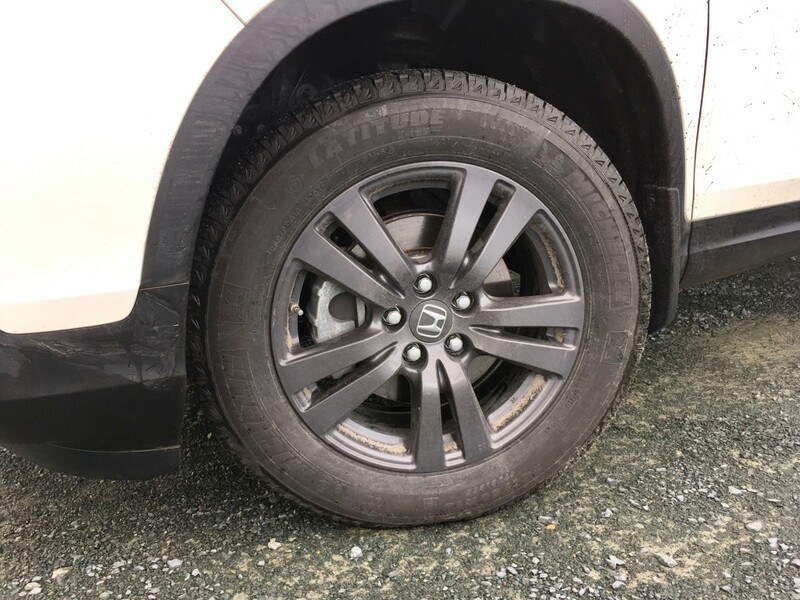 It’s a little too curvaceous up front, with a ride height that’s a little too low and it has wheels that look like shopping cart wheels compared to the optional 20’s fitted to your half tonne. But the new look is still undoubtedly Honda. The front fascia takes its cues from the Pilot, all while maintaining its own unique look. Those wheels, while only 18’s, are actually quite nice to look at being coloured dark grey. Dark coloured wheels being all the rage these days, after all. The rear doesn’t try overly hard to be stylish, only the LED tail lights seem a bit flashy, but let’s be honest; your truck likely is fitted with LED’s now too. My tester was the ‘Sport’ model and as far as trucks go, the look does seem to fit decently will with the Sport logo on the front. With that said many of the friends I showed it to were immediately turned off by the front end design and preferred the more angular styling of the first generation. And if that weren’t enough, pulling up at a light next to a Ford F-350 Crew Cab packed with four blue collar guys with dirty construction gear generated an onslaught of laughter and mocking gestures. However, since styling is purely subjective, let’s perhaps agree to disagree and move on, truck fans. 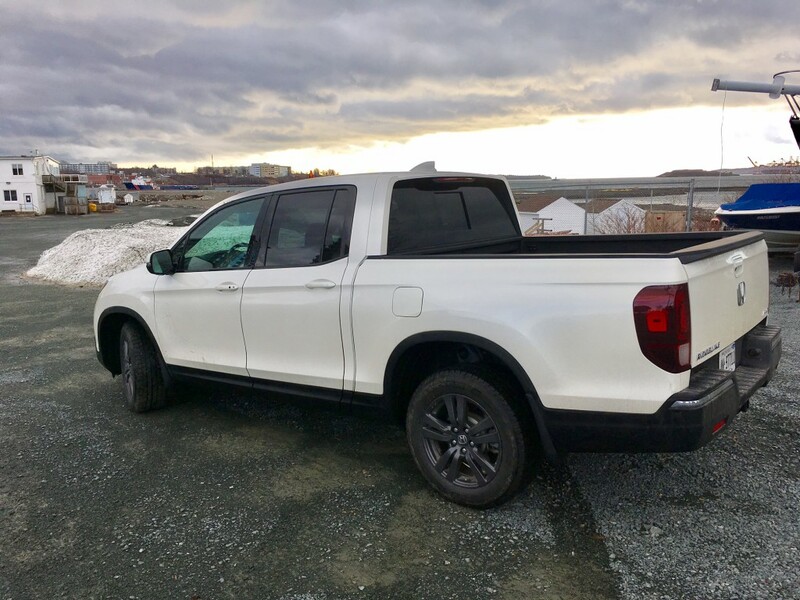 The Ridgeline can only be configured one way and that’s in crew cab form with a 64-inch long bed. 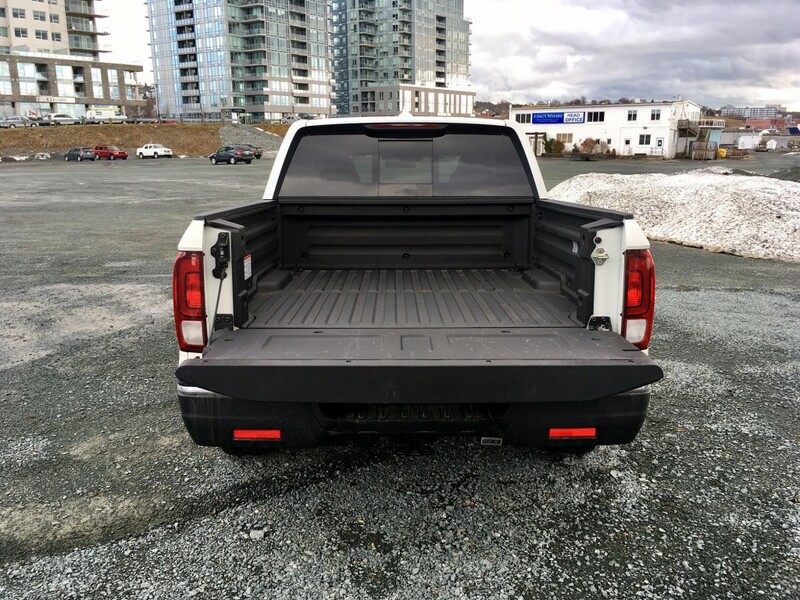 Surprisingly, that is actually longer than the 60-inch bed offered in the four-door Toyota Tacoma, which is well respected within the truck community, so keep that in mind truck fans. However, the bed itself is fairly shallow but there’s a good reason why. 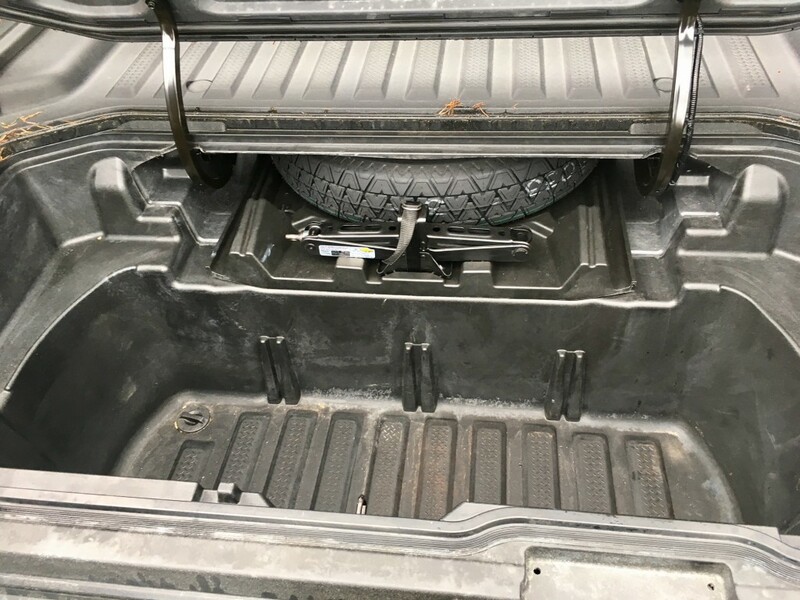 The Ridgeline features a deep, sizeable and lockable trunk underneath half of the bed floor. It also features a drain hole to boot so it can keep your fave brews cold during your tailgate parties. 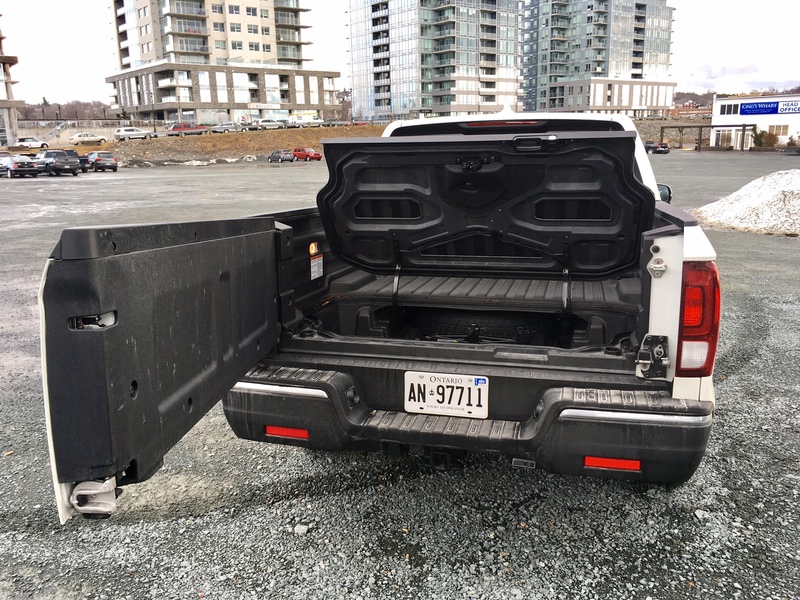 And while the trunk can be accessed with the tailgate down, the gate can swing open sideways allowing for easier access to both the trunk and the bed. Your F-150 can’t do that. One issue with the tailgate though, is that it isn’t dampened, so be sure to hang on to it while opening. 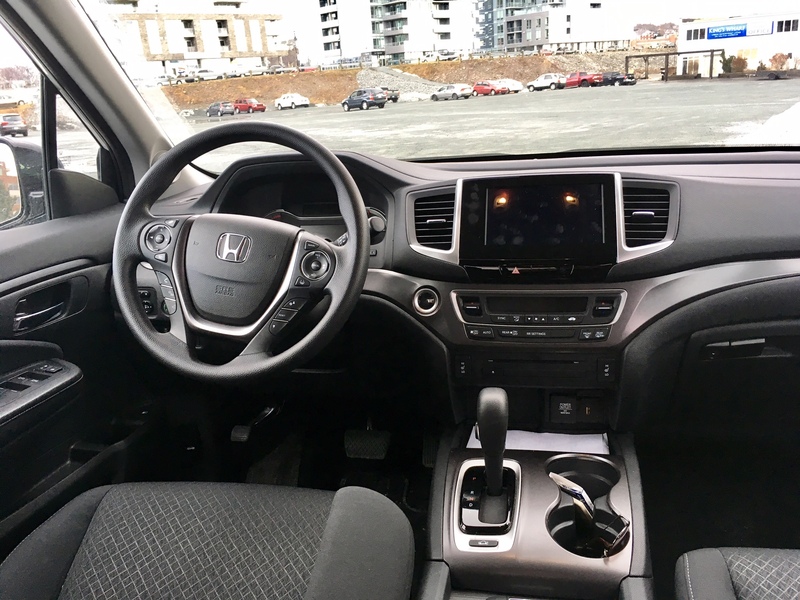 If you’ve spent any measure of time in the new Pilot, the interior of the Ridgeline should be like having deja-vu. In fact, despite my best efforts, after looking at pictures side by side, I can’t pick out any discernable styling differences between the two. They are identical. This isn’t a bad thing, as the layout of the Pilot is largely regarded as logical, and perhaps even stylish. With that said there are a couple of issues here: the infotainment system is the older system which is largely considered to be unintuitive and a bit finicky to use. Not to mention each command function is housed in a small area that is difficult to operate with a gloved hand (and let’s be honest, truck guys often were gloves). The other issue is, and will continue to be an issue until it’s remedied, the lack of a volume knob. 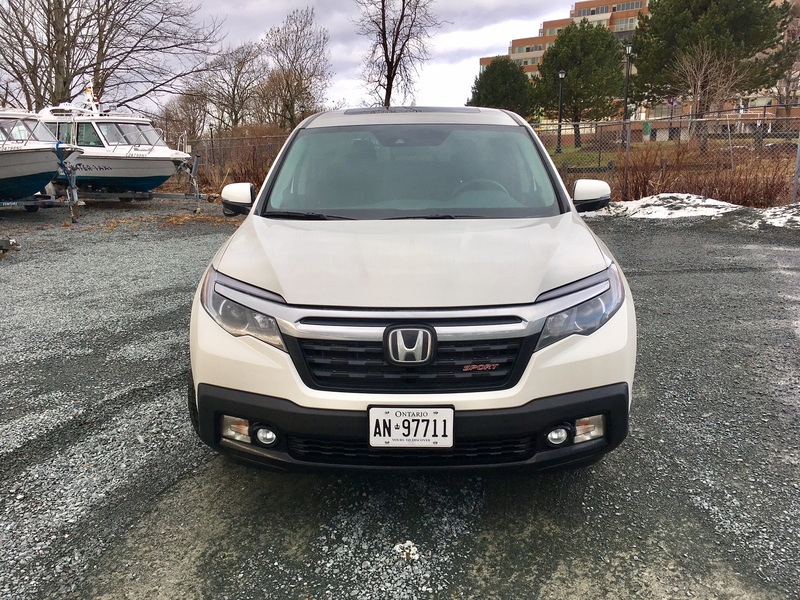 Honda has deflected some of this criticism in the past by mentioning that the volume can still be adjusted on the steering wheel, but unfortunately this argument is moot in the Sport trim level as there is no volume button to be found on the wheel. These grim days for Honda interior functionality appear to be fading though as the latest CR-V debuted with our beloved volume knob. Happily, interior room is good for a truck this size. 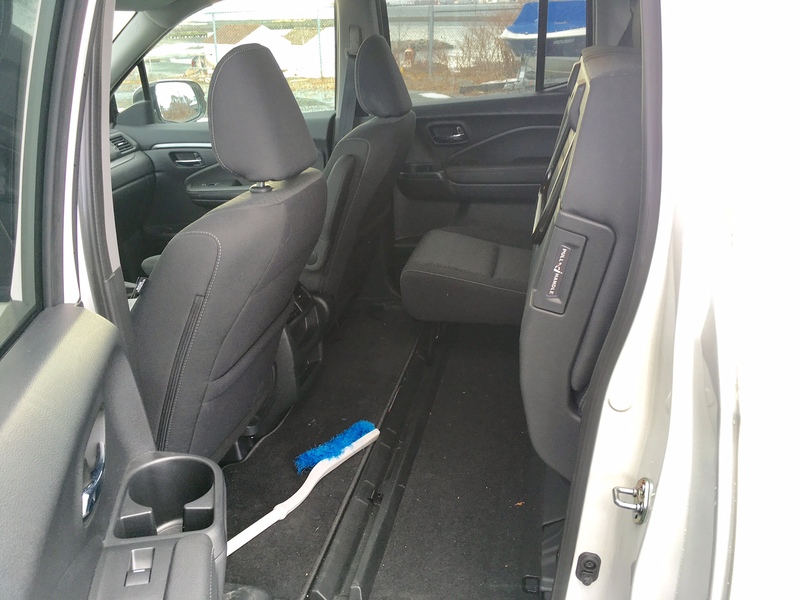 The rear seat cushions flip upward to give more cargo space though the floor isn’t completely flat. Rear leg room and head room would be adequate for most though. You can have any engine you’d like in the new Ridgeline, as long as it’s the 3.5 litre V6 which produces 290 horsepower and pound feet of torque mated to a six-speed automatic. Thankfully, this gearbox is operated by a traditional shifter and not Honda’s cumbersome push button transmission found on the Pilot. The end result is a rev-happy engine that translates in a quick feeling vehicle. There is an Econ button for fuel efficiency, but even with it engaged I didn’t find myself feeling bogged down. This is a quick truck that feels light on its feet and I doubt any truck guy would find themselves wanting more power. And the best part is, the power is naturally aspirated – no turbos means no lag. Just power whenever you need it, and a refined, civilized personality when you don’t. This pleasantness is translated into the ride quality. Okay, again, stop right there truck fans. Because I know the next words out of your mouth are, “that’s because it isn’t a real truck. A real truck would have a body on frame”. True, but why is a uni-body frame a bad thing for driving around town? It’s comfortable and sturdier as opposed to jarring and floaty. It steers and handles with more precision and ease. It soaks up potholes and other imperfections in the road with Buick-like abilities. Handling is impressive; you can actually have a measure of fun on the twisty back roads. 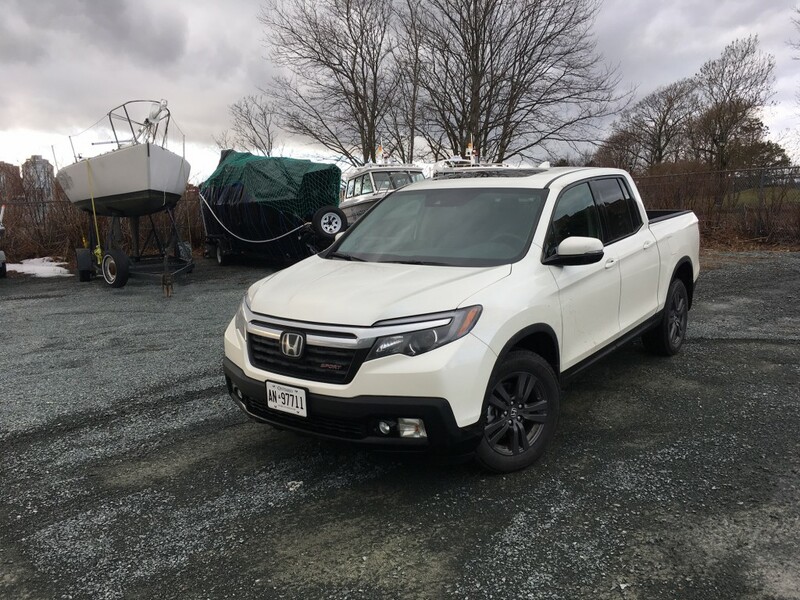 And given its smaller size, the Ridgeline is a breeze to park as tight parking lots are no match for it. Its lower stance makes it easy for ingress and egress and which saves you money on running boards. 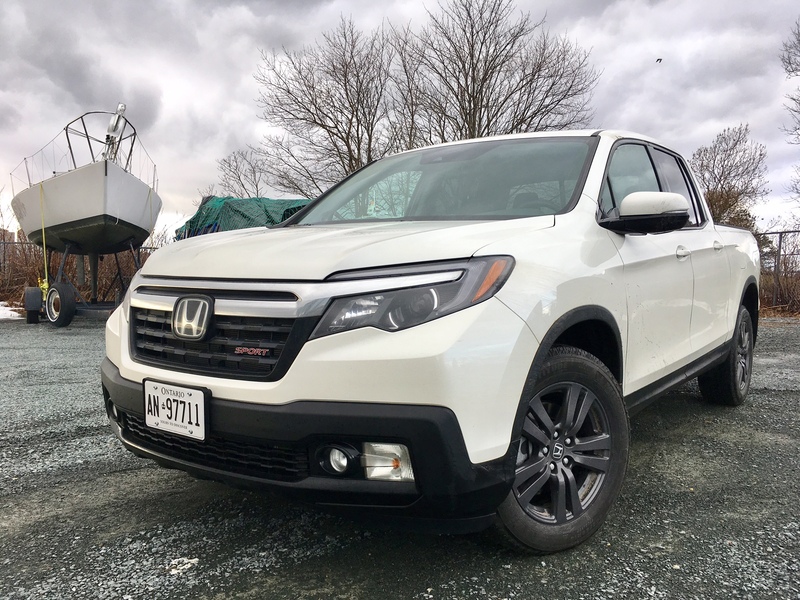 The Ridgeline feels as if you’re driving a crossover as opposed to a truck. And on paved roads and in the city, that is very much a good thing. And yes, truck purists, I can already hear your counter arguments to how it performs beyond those conditions; off-road. That’s where body on frame trucks reign and where they make a lot more sense. I’m not arguing that. The Ridgeline has the aforementioned lower right height and thus worst approach and break over angles. It also only has a towing capacity of 5,000 pounds. But it would only be fair to mention that, despite this, it can still hold its own in mild to medium off-roading. 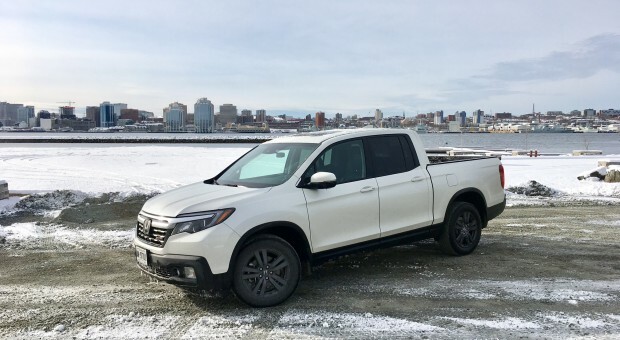 In fact, the Ridgeline best tackled 30 cms of snow which was dumped on Halifax during my time with it, thanks in part to good winter tires, but also to Honda’s notable all-wheel drive system. The bottom line is, the Ridgeline can likely handle most off-roading adventures, along with any weather thrown at it. It also handily beats any pick-up currently sold today for on-road characteristics. On top of that, and in spite of a rev-happy engine, the Ridgeline delivers decent fuel consumption numbers. It’s officially rated at 12.8 L/100 kms city and 9.5 highway leaving it with 11.3 combined driving. During my week of combined driving, my real world results were spot on: 11.3 L/100 kms. Not only is it refreshing to drive a vehicle that actually meets its official ratings, but it’s good to know they are achievable both in frigid temperatures and under a weighted right foot. So, truck fans there you have it. I know this won’t get you into Honda dealerships any time soon to trade in your real trucks, but this vehicle clearly isn’t meant for you anyway. It’s meant for the mass amounts of people who buy real trucks yet make little use of their truck-like capabilities all while suffering the cons of having a real truck (such as fuel consumption, size, ride etc). The Ridgeline is perfect for these people who live in the city yet still believe they need a truck. It can haul, tow and go off road like a truck, but it’s comfortable, good on gas, refined, and versatile to boot. It even has a boot! Perfect for keeping valuables safe in mall parking lots. The bottom line is, this thing makes sense for most people. For those who need a real truck, well, there are plenty to choose from so go ahead and choose your weapon. Just stop picking on the people who may want something a little more catered to their personal situation.